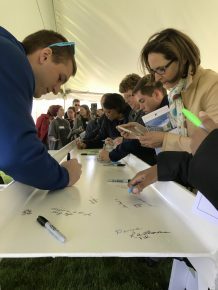 It was out with the shovels and in with the Sharpies on May 2 when Butler University held a beam-signing ceremony to dedicate the construction of the new 647-bed student residence hall that will replace the old Schwitzer Hall at 750 W. Hampton Drive. Instead of a traditional groundbreaking ceremony, students, faculty, staff, alumni, and friends of the University signed a beam that will be used in the construction of the four-story facility. The event also showcased items from a time capsule that had been placed in a cornerstone of Schwitzer Hall more than 60 years ago. The new housing, to be built in partnership with American Campus Communities (ACC) and open in fall 2018, will feature suite-style living units, with two double-occupancy rooms linked by a shared lavatory. Amenities will include gaming alcoves, study rooms, a fitness room, an interior bike room, and a large meeting room that supports the residents, student organizations, Greek chapters, and campus programming. The second floor will include a faculty office suite with a lounge space, a kitchen with a communal table, a 10-person conference room, and an individual private lounge. There will be eight residential study lounges—some with small conference rooms—and large neighborhood lounges, as well as a 24-person study room. The outdoor facilities will feature a study lounge, a quiet courtyard with a rain garden, an active courtyard with a fire pit, a pedestrian walk, bike path, bike racks, and an open lawn to the west of the building. 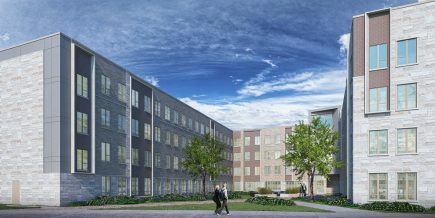 As with Fairview House, the 633-bed residence hall that opened in fall 2016, American Campus Communities will build and maintain the new facility, while Butler will provide staff to manage the building. The Resident Assistants (RA’s), the Residence Life Coordinator, and the Faculty in Residence will all be Butler personnel.